I get a call form a good friend of hubby’s.. Can you make me a quilt that is 5 feet by 5 feet (60″x60″) I like your cubic quilt that you made Garrett. I called it “Kubic Kittens” click to pattern link. Ok…What colors do you want? Do you want the cats? No cats. I remember African themed artifacts in their home. Well this is his rug, he sends me these pictures. We have a winner.. on layout but I was not happy with the tiger one and I send him this picture and let him know that I think this would look better with the gold and burgundy. It turns out this was the one he was looking at all along. I gave him a material quote based on fabric at LQS retail prices and total came in over $150. This is where I usually loose custom customers as they do not realize the cost of materials.. Now he needs to think about it. This is the process of building the quilt from start to finish…. I cut 7 strips WOF and sub cut them into diamonds. Till I had the amount that I needed of the 3 fabrics to make all the blocks. 15 minutes. 2. I sewed the sandy fabric to the rust hut houses fabric… be sure to leave 1/4″ seam at each end of the seam. Lay out on the design wall, since I was using directional fabric I wanted to keep them in order with them pointing up, left, down, right. 4. cut the black border diamonds and triangles to make the top rectangular. When I was figuring the triangles that I needed, I added 7/8″ to the diamond shape then cut them in half to get the shape I needed whether it was a equilateral or isosceles triangle. they are abit big but i can always trim them off to square the top with binding later. 5. Layout on my design wall and start sewing the rows. 8 Made the backing .. this I used all the leftovers to piece it. I had many variations so I took pictures and sent them to my friend for approval on witch one he liked best. 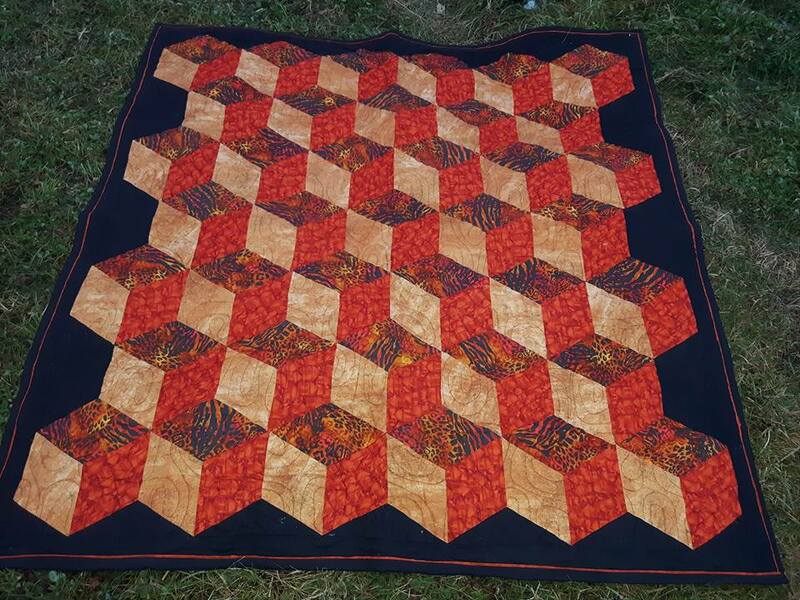 9 next is to load on the longarm, I quilted it using a panto on my HQ 16 the panto that I used is from Urban Elements and it is called African Samba. 9. Last thing to do was to bind it so I used the magic binding technique that I learned from Aunt Marti’s tutorial – Susie’s magic binding. I used all the left overs for the back of the quilt. Here is the finished product. Now it just needs to find its way to its final home, but with one detour I hope our quilt guild is hosting a quilt show in Mach 17 2018 so I would love to display it. Next 2017 Christmas sew along…Stellar Cabins, Playing with color.